Gazza 2. This time it’s with Greavsie. As documented in this very blog, Gazza is no stranger to the UK’s original new town. 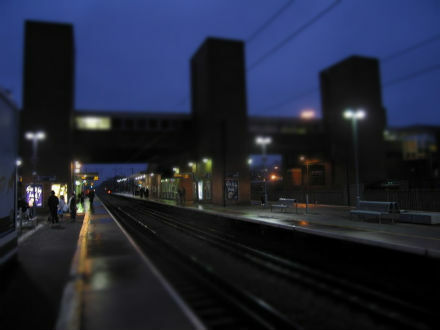 One night, on a particularly low ebb he contemplated suicide on Platform 1 at Stevenage station. Now he’s back, on the other side of Lytton Way (no bridge-jumping Paul!) appearing at the Gordon Craig theatre with Jimmy Greaves. Is Ian St John dead, does anyone know? Now I love a good footie anecdote and these two will be regaling the audience with some beauties, I have no doubt. After all, it really IS a funny old game. My worry is 2 people with well-documented struggles with alcohol left to their own devices after the show in a strange town – and all the other towns on their extensive UK tour. And for the record, there is infinite love in my heart for Gazza. And that probably goes for the rest of the country too. Do a good show, guys. Emile Heskey transferred to Daneshill. There’s a chap who used to park in Swingate. Green Y reg Citroen. Looks a bit like Emile Heskey. But shorter. We used to arrive at roughly the same time each morning. Well, the big news is he seems to have swapped Swingate for Daneshill, the local rival. Don’t know why. Maybe there were more opportunities, maybe he just fancied a move. The 2 car parks are only yards apart but he’s made the big move to the other side. Good luck to him I say. Me? I’m sticking with Swingate. Someone needs to show some loyalty, for god’s sake! Just how long can you drag Christmas out for? Our tree was out in the garden before the year was out – but it was dead on its feet, drooping alarmingly. Not so at the Gordon Craig Theatre in Stevenage; Christmas is still in full swing. Their version of Snow White is running until January 23. Now I’ve been to see it and I heartily recommend it, so the good news is you’ve stll got time to get along and see the show. It stars Sue Holderness out of Boycie and Marlene out of ‘Green Green Grass’ out of ‘Only Fools and Horses’. Katie Rowley Jones needs directions for the West End, apparently. Anyway, it’s not unusual to have a panto run to the end of Jan. However, in the run-up to the show, the theatre played Christmas tunes in the adjoining walkway that leads to the station to get everyone in the mood and hopefully flog a few more tickets. So here’s the thing: they’re still playing these tunes now and it’s January 19. "...in the lane, snow is glistenin'..."
I read somewhere they had to rename the dwarves (Dopey to Dippy, etc.) to avoid failing foul of Disney’s legal eagles. Boooo! I always enjoy reading the programme to see what else the actors have been in. What did I learn? That you have to be a pretty rubbish dwarf not to have worked on Star Wars or Harry Potter. They’ve all done ’em. 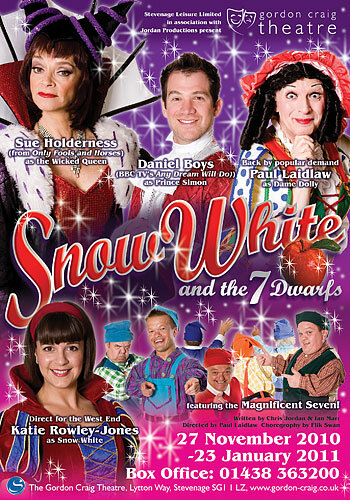 The theatre must have to decide on Snow White very early to make sure they can book all 7 dwarves – there must be a run on them at Christmas. No good getting 5 and making up the numbers with fully-grown Lanky and Lofty. Saw a couple of ’em in Tesco the other day. Easy to spot if you’re near enough. 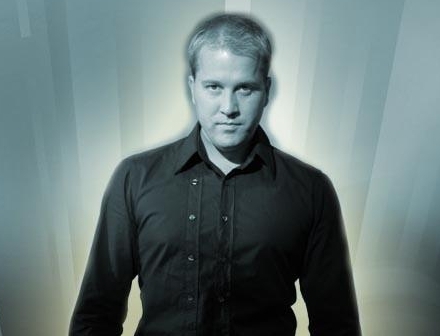 An evening with psychic, Tony Stockwell. Walking between the station and Swingate, one passes by the Gordon Craig Theatre and you tend to see posters advertising upcoming events. On October 4, Stevenage hosts ‘An Evening with Tony Stockwell’. Do you think that’s his real name or just a stage name? I like to think someone told the then Dave Stockwell that they’d seen a hypnotist called Tony Le Mesmer on Alan Partridge’s “Knowing Me, Knowing You,” suggesting he should try that name, but he went and changed the first name instead of the second. Tony Stockwell. And he's looking at YOU! I was in Stockwell last week. Didn’t strike me as a hotspot for psychics though. But you knew I was going to say that, didn’t you. I went to the Panto the other day (Oh yes I did!). It was my wife’s idea to go – and what a good idea it was. We kept it secret from the kids until we were actually in the theatre foyer. You should have seen their faces (they were happy). I walk past Stevenage’s Gordon Craig Theatre twice every day (not out of habit, out of necessity). They’ve got a whacking great banner and a window display advertising this year’s panto, Aladdin, starring me old mate John Altman (nasty Nick in EastEnders) – see My Celebrity Whirl Panto Edition for the backstory. Paul Laidlaw: writer, director, Twanky. After seeing it advertised for so many weeks, I was intrigued to see the show – and the inside of the Gordon Craig theatre itself. I wasn’t disappointed. I have it on good authority that Widow Twanky (or the guy that plays him) writes and directs the show. Well that’s not a secret, but the word is as soon as he’s finished this year’s run, he’s straight on the next one. This is a man who spends his entire working life in Pantoland – like that bloke who used to celebrate Christmas every day until he ran out of money. He must spend the year sourcing giant golden lamps, auditioning dwarves and collecting all the cracker jokes he can find. To be fair, it was very entertaining. Wishy Washy stood out for me – a real tour de force, as those West End reviewers might say. To top it off, my wife and I even caught the marshmallows they threw into the audience – and we were in Row L! The view from Row L.
Their run comes to an end on January 24 – that’s nearly 2 months – with matinees too. That’s a lot of “he’s-behind-you”s. 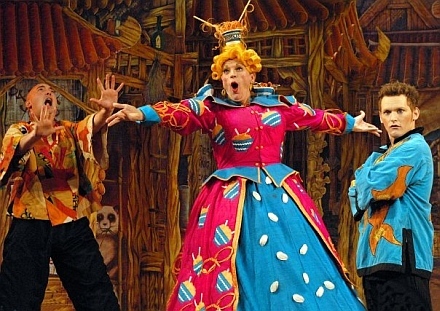 Add in rehearsals and the cast and crew have spent a quarter of the year in Panto. They must have difficulty adjusting to society afterwards; constantly wary of custard pies or saying “Hello boys and girls” every time they walk into a room. Can’t wait for next year’s extravaganza. Good show chaps, I’ll be back next year. 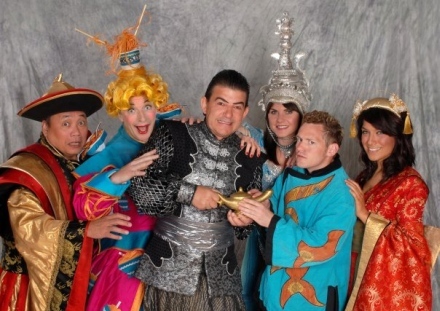 My Celebrity Whirl – Panto Edition. Next up in my pantheon of stardom is John Altman, best-known as Nasty Nick Cotton from out of off of off of EastEnders. Where are the brussel sprouts? Behind you!!! 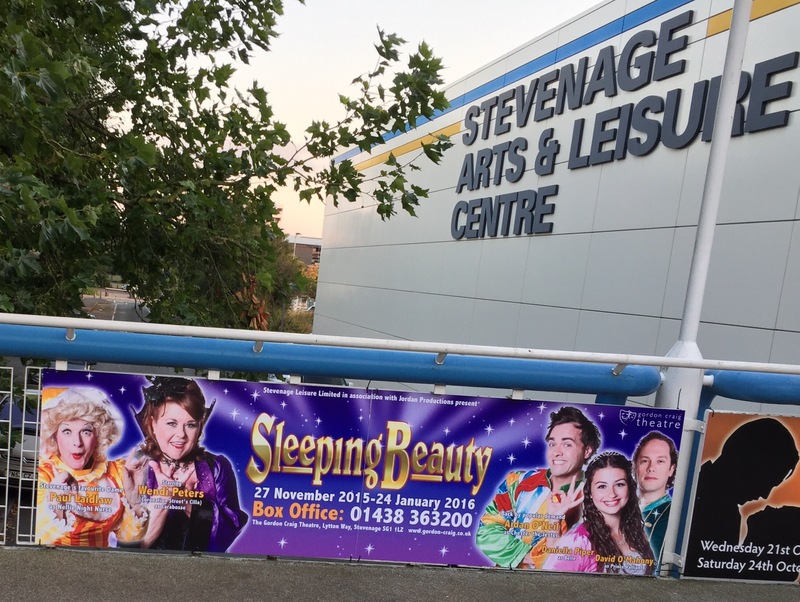 I’d been meaning to mention the panto at Stevenage and John has forced my hand. So there I am in Tesco getting some bits for my son’s birthday party and who’s that inspecting the lettuce – my new best pal John. He’s playing the lead in Aladdin at the Gordon Craig Theatre, cultural beacon of Stevenage and the one landmark you could pick out from the train if you were just passing through. Must be opening night soon. So are they putting John up in a swanky hotel somewhere nearby (the Ibis is perilously close) or have they found him a nice place to rent for a month? My money’s on the latter. Checking a YouTube interview, John says he’s staying up in Henlow – that’s about 20 minutes away. Still reckon it’s a house. In the meantime, you can keep up with rehearsals with this fascinating behind-the-wall, fly-on-the-scenes video-blog! Friday. Cloudy. Just before the rain. Quite heavy rain at that. And thunder. And pinkish lighting. "By the power of Greyskull. Hooooo!!!" The sky is not a happy bunny. Oh well, the fact that I’ve posted this and both of you have read this proves that the world didn’t end after all. It was just a few clouds. But it was a close call. Consider it a warning.